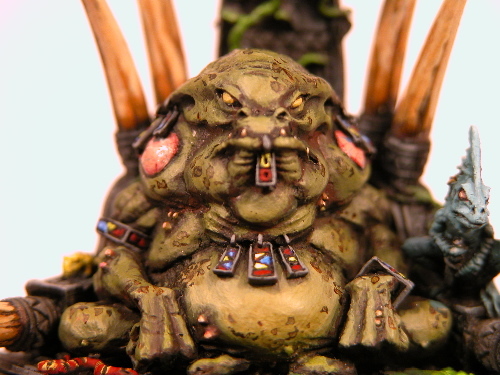 Painting the slann mage priest This is not meant as a definitive article on painting this particular model, as I know I am not the best painter. It is rather a tale of my experiences on painting it. And look! Here it is! I have to say that the moment I saw the old frog, I knew I had to buy it. Thing is, I was trying to put off buying models on whims, and rather focusing on my armies. However, once I had completed a satisfactory amount of my still growing force, I eyed the model again, and bought and promptly assembled it, primed it, and then was torn away. The beastmen came out, and I busily expanded my chaos force, forgetting all about the toady fellow. It might have ended up that he would never have been painted, but then something unexpected happened. A great friend of mine who I was still in contact with, despite his movement to to Auzzie land, had a loss in the family, and would be able to see me for a couple days. After a week of alternating sadness and glee, he was there. We’re at a similar painting level, and I’m always in the mood to push myself further every time I see him, so I brushed off a pile of mini bits that had collected on the Slann, and began painting him. The first big obstacle was how to paint his skin (Or her skin. Or it’s. Didn’t I once hear about some frogs being asexual? I think that was Jurassic Park…) Anyway, I didn’t want to copy the GW paintjob, which I loved, and all examples of doing it very colorfully hadn’t turned out very well in my opinion. I settled on a dark, toad-like look. I started the skin with a complete coat of a dark brown, GW’s scorched brown. I then gave this a black wash, and highlighted this with a layer of one half scorched brown, one half GW’s catachan green. This was then gradually highlighted with catachan green, until I used it pure. Then I began highlighting this with GW’s camo green until I came to a point that was almost as light as I wanted it. However, I didn’t want it to have an overly camo green coloration, so I then highlighted this mixture with GW’s bleached bone, until I reached a shade I was pleased with, and then gave it a watered down catachan green/scorched brown wash. I also painted his little “skin circles” GW’s tanned flesh, highlighted with GW’s elf flesh. I then thinly painted red and blue veins, which where given a wash of elf flesh to ‘soften’ them. To give the area wet, mucus covered, look, I added a gloss finish. I highlighted the warts further with bleached bone, and gave them a dark red wash (watered down GW’s scab red) to achieve the desired effect. 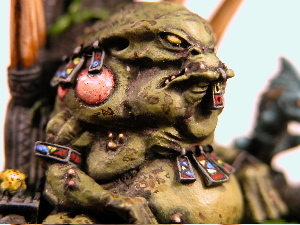 To get a toad-like speckled pattern, I took my watered down catachan green/scorched brown wash, and put a little “bubble” onto the skin, then left it a few seconds, before dabbing it away with tissue, leaving a darker circle with a dark out line. I then repeated this on appropriate places on the skin. I pulled it off fairly well, and will use it again on similar surfaces. The idea came from when I was working with watercolors, where it is undesirable if this happens. The stone was simply drybrushed GW’s codex grey followed by a black wash. The vines were painted GW’s goblin green, highlighted with camo green, followed by sunburst yellow. 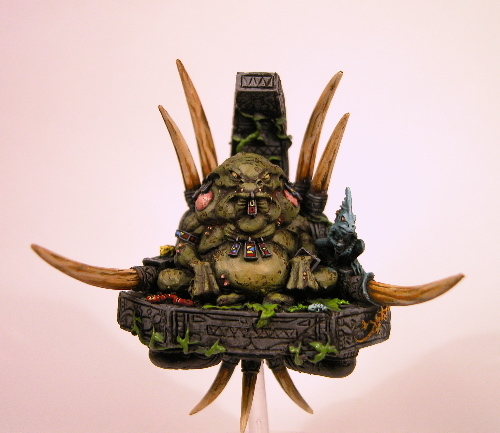 I then painted the leaves he is sitting on catachan green, highlighted up with golblin green and GW’s sunburst yellow. In the pic they look a bit too shinier than in real life. Small jungle dwelling creatures festoon the model, I can see the sculptor had a lot of fun making this! 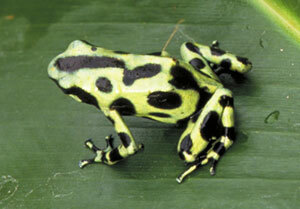 I wanted to do an accurate job on the two frogs, so I went online and found some reference of poison dart frogs. One was given a coat of sunburst yellow, with a scorched brown wash, and then a speckled black pattern. The other was done with a turquoise color made from mixing white, GW’s storm blue, and goblin green, and given the same black speckled pattern. 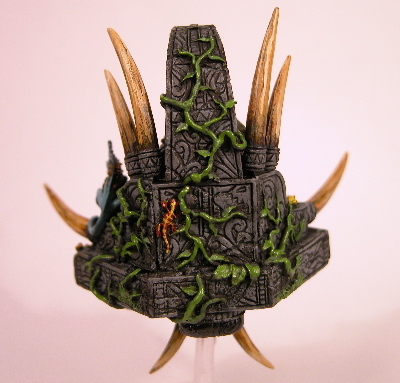 I think the skink has so much character, I imagine him crouching there, sucking up to the slann all day. 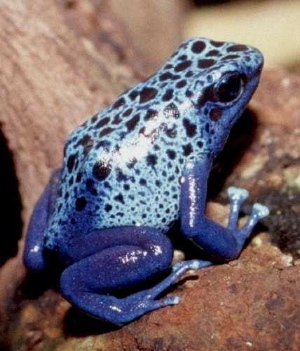 The little teacher’s pet was painted with the same turquoise color as the frog, though with a darker storm blue base. I painted the snake as a King Snake. In fact, it’s completely accurate! See, when I was little, I had this book about snakes, and there was a little rhyme to distinguish it between a similarly patterned snake: “Red to black poison lack. Red to yellow, nasty fellow.” Words to live by those are… The first lizard was done in a tan color, with dark brown markings like a giraffe. The second was originally painted a very yellowy green, and although it blended in very well, as it would in nature, it made the back of the model a bit too boring. I then decided to paint him red with yellow stripes. I don’t think he turned out all that great, but it adds some color. His various “jewelry” was then picked out in primary colors. Also, the magnets (large stones on the underside of the model) were given a gloss finish over black. Finally, I came to the horns. These were a challenge because, sculpted onto them were grooves that were a noticeable texture, but not noticeable enough to follow when painting them. I decided to paint bleached bone, and then add a brown ink wash to bring out the grooves. This worked quite well, though I half fudged it in the end. They were painted with the brown ink base, highlighted up through GW’s snakebite leather and bleached bone. I decided not to give it a scenic base, and instead have the focus be on the model. I may have to add an actual gaming base in the future, as I plan on entering him into Gamesday (So I’m counting on you not to copy my idea! Oh wait, then I guess the step by step instructions where a bit silly…oh well!). I recommend this mini to all, it’s quick to assemble, and an absolute JOY to paint. It reminds me why I’m in this hobby after all. I sometimes begin to love focus on it after spending so much time building armies. Anyway, I hope you enjoyed my first article. Sometime I might make another… Comments would be appreciated!